As almost everyone knows, the Earth is not alone in space. It has seven siblings, other planets that also orbit the Sun. Five of these – Mercury, Venus, Mars, Jupiter, and Saturn – can be spotted with only the naked eye. But which planets can be seen tonight? Planets when they are visible, appear as bright “stars” that will gradually move over time. Mercury and Venus move the quickest and careful daily observation will reveal their passage against the brighter background stars. Mars, Jupiter, and Saturn can also be seen to move. Slower than Mercury and Venus, you may need to note their positions and watch them carefully for several weeks to notice a change. 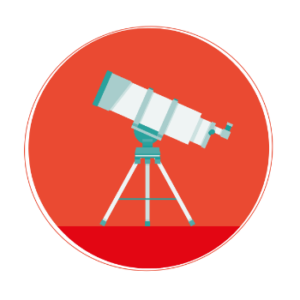 The two most distant planets – Uranus and Neptune – require binoculars or a telescope to be seen. As with the other worlds, you can track their movements but you’ll need a good star chart and months to notice a difference. Every world is different but whether you’re looking at one of the five easily visible planets or the fainter pair, you’ll notice they all have one thing in common: unless the planet is close to the horizon, they don’t appear to twinkle. This helps us to identify the planet among the more distant stars and is especially useful when observing Uranus and Neptune. The reason they don’t twinkle is that they each appear as very small discs in the sky, whereas the stars are merely tiny points of light. The light of the stars is more susceptible to changes in the atmosphere and they will twinkle as a result. 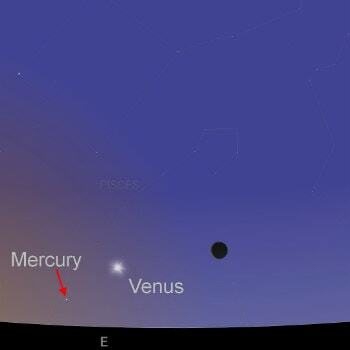 Is Mercury, The Elusive Planet, Visible Tonight? Of all the planets, Mercury is the closest to the Sun and, consequently, never strays very far from the Sun in the sky. It always appears close to the horizon just before sunrise or just after sunset and is never visible at midnight. Taking just 88 days to complete one orbit, it moves quickly and may only be visible for a few weeks at a time. As a result, it can be tricky to spot and some people go their entire lives without ever seeing the planet at all. Astute sky watchers keep track of its movements and wait for a crescent Moon to appear nearby. The Moon then serves as a convenient marker, allowing astronomers to more easily spot the pinkish-white light of the planet. 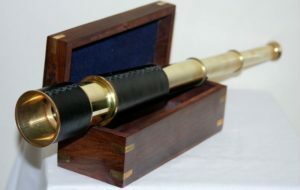 Binoculars won’t reveal anything of the planet and a telescope is required to see anything more than a point of light. A small telescope with a low magnification of only about 40x will show a tiny disc and a higher magnification will reveal phases like the Moon. If you want to see more detail, you’ll need a large telescope and a much higher magnification. Mercury starts 2019 by making a brief appearance in the evening sky in late February. Early risers can catch Mercury in the morning sky from late March and throughout April. After a June appearance in the evening sky, it returns to the morning for the first half of August. It finally appears again in the morning from late November to mid-December. Where Can You Find Venus? Of all the planets, Venus is the most easily seen. It’s our closest neighbor and, after the Sun and Moon, is the third brightest natural object in the sky. It’s the second planet in distance from the Sun and, like Mercury, can only be seen in the predawn or evening twilight and never at midnight. When visible, it appears as a brilliant white “star” for months on end and can be a very pretty sight when the Moon is nearby. If the planet is close to the horizon it will glimmer with a multitude of different colors, making it a very conspicuous sight. In fact, it has often been reported as a UFO by unsuspecting members of the public! 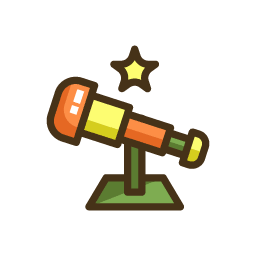 Good binoculars may show a very tiny disc, but a small telescope will show you more. Like Mercury, the planet has phases, like those of the Moon, and a magnification of around 100x should reveal this. Venus begins 2019 in the morning sky and remains there until early June. It’ll vanish behind the Sun for about four months and then emerge into the evening sky around mid-October. It will be at its best in April 2020 and will remain visible for another month after that. All the other planets orbit beyond the Earth and, as such, may be visible at any time of the night. It depends upon the positions of both the Earth and the planet in their orbits. With the exception of Mars, all these outer planets reach their best visibility once a year. At that time, the planet in question can be seen from sunset to sunrise and is best seen around midnight. When Can We See Mars from Earth? Mars, the fourth in distance from the Sun (after the Earth) takes 687 days to complete an orbit and unfortunately, is only at its best every two years or so. When this happens, it appears as a brilliant coppery orange “star”, brighter than all the others in the sky. You typically won’t be able to see anything more than a star-like point through binoculars. 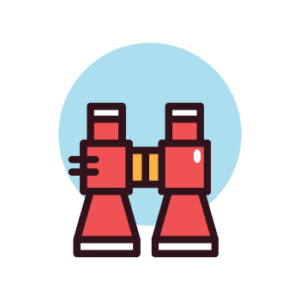 Sometimes, when the planet is at its best, a good pair of binoculars may just be able to show a tiny disc, but a telescope will always provide a better view. Again, unless you’re observing the planet at its best, you may not see much. However, if the planet is close to the Earth, you’ll only need a magnification of about 50x to see a disc. 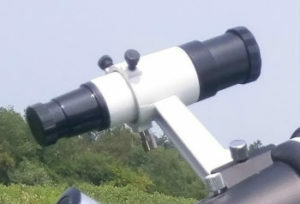 Doubling the magnification to 100x may also reveal some dark surface markings and the glint of a polar ice cap. The planet was most recently at its best in 2018 and, unfortunately, isn’t very well seen in 2019. That being said, it’ll remain visible in the evening sky until mid July but will not be visible for the remainder of the year. It’ll return to the morning sky in early January 2020 and will be at its best again by the end of September. Jupiter, the largest of the planets and fifth in distance from the Sun, takes nearly twelve years to orbit the Sun. It appears yellow-white to the naked eye, like pale gold. Unlike the other planets, Jupiter is well worth a look with binoculars. Even a modest set of 10×50 binoculars will reveal a tiny disc and its four largest moons on either side of the planet. Sharp-eyed observers have even reported seeing these moons with just their eyes. Nothing, however, compares to the view through a telescope. The moons are easily visible and can be tracked as they move from hour to hour. The disc is clearly seen with a low magnification of about 30x while the dark bands of its atmosphere may also be glimpsed. Larger telescopes and magnifications may also reveal the famous Great Red Spot. This storm, large enough to swallow the Earth, has been observed for centuries. Jupiter starts the year in the morning sky and is best during the first twenty days of June. Throughout this time it will be moving among the stars of Ophiuchus, the Serpent Bearer. It will move into Sagittarius, the Archer, at the end of November before disappearing behind the Sun in early December. Saturn is the most distant planet known to the ancients. The planet appears as a yellow-ish starlike point to the naked eye but a small telescope is required to see its famous set of rings. Despite being the faintest of the naked eye planets, it still appears brighter than most stars and is easily seen when at its best. For many, Saturn is the jewel in the crown of the solar system. When its rings appear wide open to us, good binoculars may show the planet as a tiny, elongated spark of light. Nothing compares to seeing Saturn through a telescope for the first time. Small telescopes and a magnification of only about 30x are enough to show the rings. Several of its moons, such as Titan, are also visible. Saturn emerges into the morning sky from behind the Sun in late January 2019. It reaches its best in early July and will remain visible in the evening sky throughout the rest of the year. As it takes nearly thirty years to orbit the Sun, it typically stays within a single constellation for about two and a half years. This year it never strays from the stars of Sagittarius but will eventually cross into Capricornus during the last ten days of 2020. Our next planet, Uranus, is faint but barely visible with the naked eye under dark skies. That being said, you have to know precisely where to look. For that reason, the vast majority of astronomers use binoculars or a telescope to observe this distant world. It orbits the Sun once every 84 years, taking about seven years to move through each constellation of the zodiac. It starts the year among the faint stars of Pisces, the Fish, and then moves into Aries the Ram by mid-February. It will remain there for the rest of the year. Binoculars show the planet as an unblinking pale blue-white “star”, but nothing more is visible. A small telescope may reveal a disc at about 40x but, typically, a magnification closer to 100x is needed. Unfortunately, the planet is too distant to show any atmospheric markings without a larger telescope and a higher magnification. 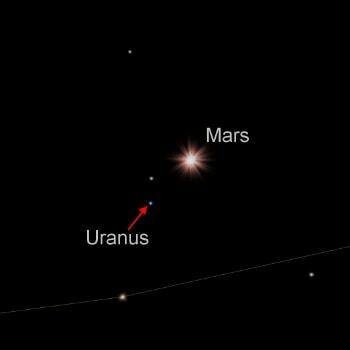 Uranus can be found sinking in the west after sunset for the first three months of the year. It’s lost within the Sun’s glare by mid April but will return to the morning sky by the end of May. It’ll be at its best toward the end of October and will be easily seen in the evening sky for the rest of the year. Neptune, the most distant planet from the Sun, can only be seen with binoculars or a small telescope. Like Uranus, it won’t appear as anything more than a star through binoculars and a high magnification is required to see a disc through a telescope. What sets Neptune apart is its color – it’s quite clearly blue, causing it to stand out from the surrounding stars. As the slowest moving planet, it takes nearly 165 years to complete an orbit of the Sun and therefore spends nearly fourteen years in each constellation. It will spend the whole of 2019 in the constellation of Aquarius and won’t move into Pisces for another four years. 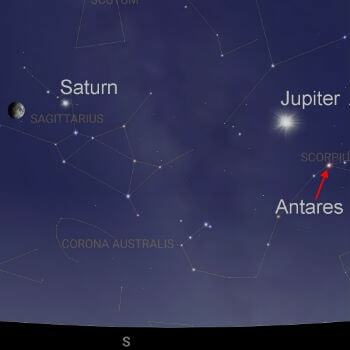 The planet first becomes visible again in the morning sky around early April. Over the next five months, its visibility will improve until September, when the planet will be at its best. Like Uranus, it then remains visible throughout the rest of the year. What Planets To See In the Upcoming Months? There isn’t a night in 2019 when at least one of the planets isn’t visible. Only thing that changes is what planets you can see tonight. 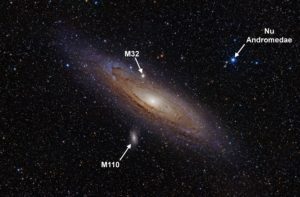 The brightest of these “moving stars” can be observed and tracked as they wander across the sky. Pretty soon, with a little help from the Moon, you can easily learn to find and identify each one – a skill that, once learned, will not be soon forgotten. Let’s start on the 10th. On this date, a crescent Moon appears just to the lower left of Mars in the evening sky. Three nights later you’ll have a chance to glimpse Uranus. 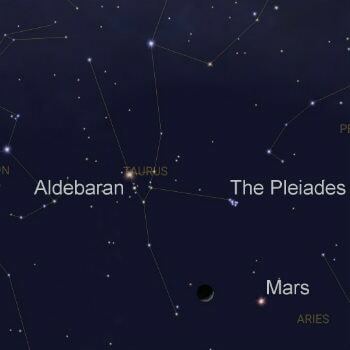 If you take a look at Mars with binoculars, you may be able to spot a blue-white star just to its lower left. If you’ve never seen the distant planet before, this could be your best chance this year. The action now turns to the south-eastern horizon in the pre-dawn twilight. 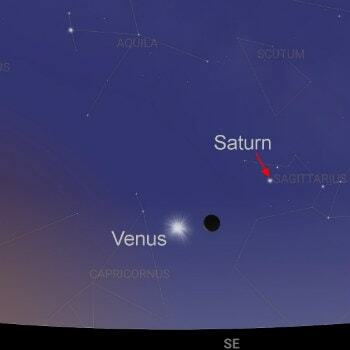 On the 17th you’ll find Venus just above fainter Saturn. Return ten days later to see the last quarter Moon to the upper right of Jupiter. It’ll appear close to Saturn in just a few days time. Meanwhile, after sunset, you may be able to spot Mercury in the evening twilight. It’ll appear as a pinkish-white “star” above the western horizon. Unfortunately, there’s no Moon or bright planets nearby, so if you’ve never seen the planet before it might be difficult to spot. February 13th, evening sky, binocular view. The month begins on the 1st with the now crescent Moon to the right of Saturn in the pre-dawn sky. Drawing a line through the pair will take you to brilliant Venus. The Moon is closest to that world the next morning. On the 3rd, you can see Saturn, Venus and the thin crescent Moon forming a line in the pre-dawn twilight. Eight days later, on the 11th, the crescent Moon is now in the evening sky. Look for it to the left of Mars. The bright orange star Aldebaran and the Pleiades star cluster appear above the pair. 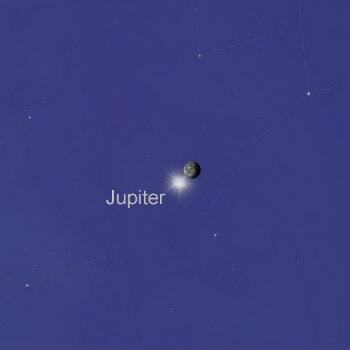 By the 27th, the last quarter Moon has reached Jupiter in the morning sky. You’ll find it to the left of the planet over the southern horizon. 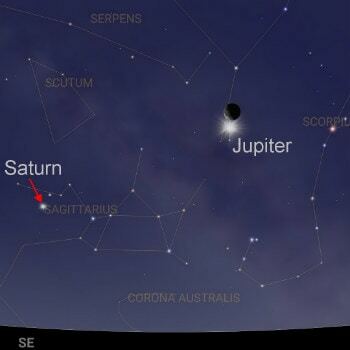 Rise early again on the 29th to see it beside Saturn. 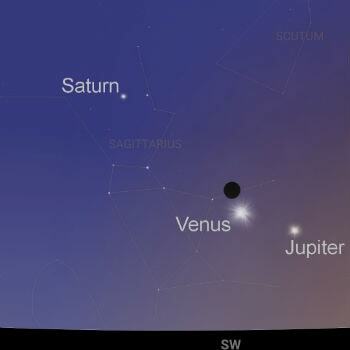 Get up early on the 1st to see a crescent Moon to the right of Venus in the morning twilight. Here’s a challenge for you: draw a line through the pair and you might glimpse Mercury to the lower left of Venus. It’s low over the eastern horizon. No luck? Try again on the 2nd. The Moon is now below Venus with Mercury to the left of the pair. Look to the west after sunset on the 8th and you’ll see the crescent Moon below Mars. Can you see the Pleiades to its right and the bright star Aldebaran above it? 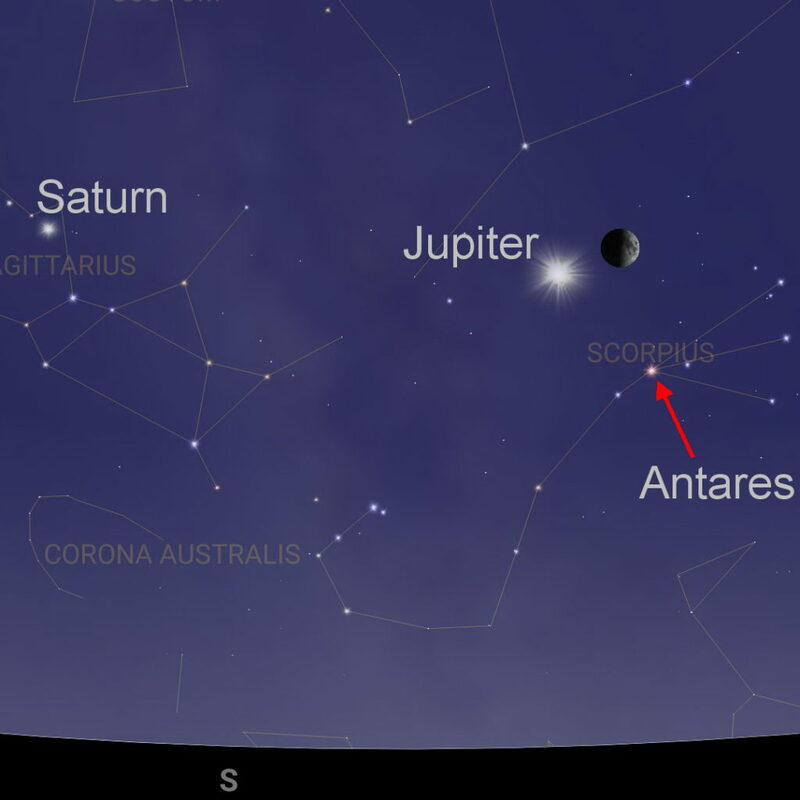 Fifteen days later, on the 23rd, the Moon appears just to the upper right of Jupiter in the morning twilight. It’ll pass close by Saturn two days later. If you missed Mercury in the morning a month ago, you have a second chance on the 1st of May. It’s in the pre-dawn sky again, low over the eastern horizon. Drawn a line from the thin crescent Moon to brilliant Venus and look for Mercury to the lower left. Just like last month, a triangle is formed by all three worlds the following morning. First, find Venus, then look to the lower right for the thin crescent Moon. Mercury appears to the left at about the same altitude as the Moon above the eastern horizon. 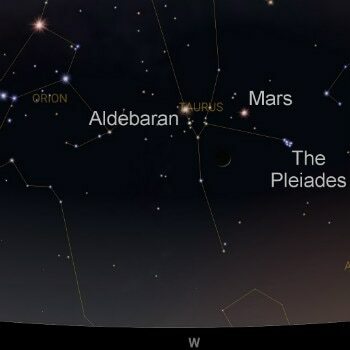 The crescent Moon then returns to the evening sky and can be found to the lower left of Mars on the 7th. 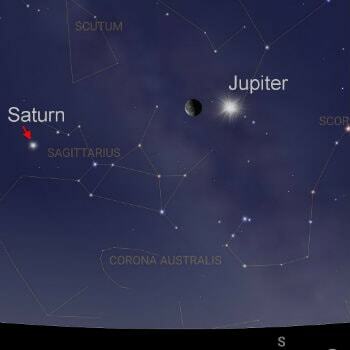 The just-past-full Moon visits Jupiter on the morning of the 20th and is then close to Saturn on the 22nd and 23rd. Again, we start on the 1st with the thin crescent Moon in the morning. It’s low over the eastern horizon and to the right of Venus. 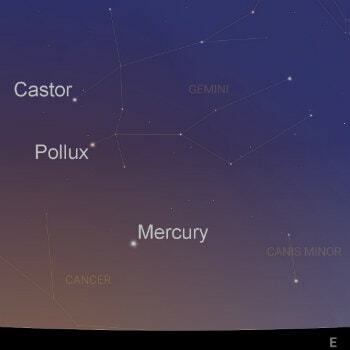 June also presents us with an excellent opportunity to spot Mercury in the evening sky. Look for it low in the north-west, shortly after sunset, on the 4th. 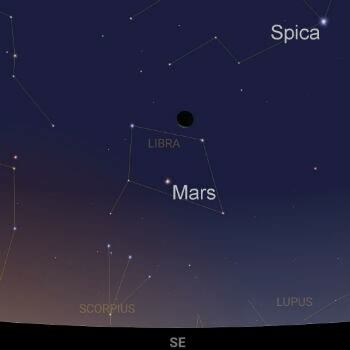 Look for a crescent Moon to its right with Mars hanging to the upper left of the Moon in the twilight. Come back the following night to see the Moon to the upper left of Mars. 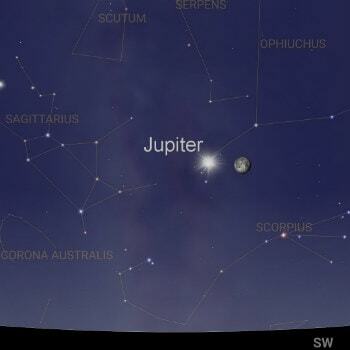 Mid-month, on the 15th, the almost full Moon appears to the upper right of Jupiter in the late evening sky. 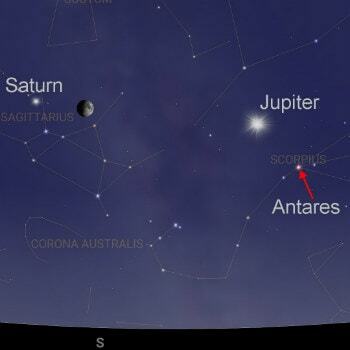 Look for the bright orange star Antares to the lower right of the Moon. Return again after sunset on the 16th and look toward the north-west. 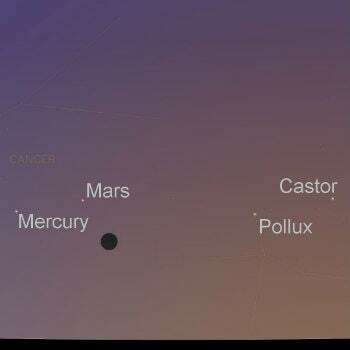 Can you see Mars and Mercury close together? Mercury is actually the brighter of the pair and appears just to the lower right of the red planet. The pair will be level (and closest) on the 17th while Mars has moved below Mercury by the 18th. Watch carefully over the next few nights to see the pair separate further. 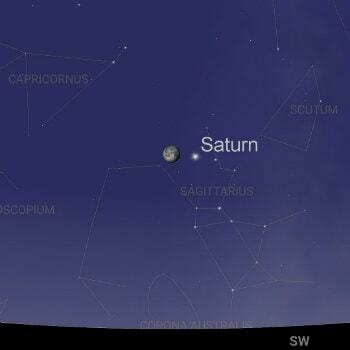 Lastly, rise early on the 19th to catch the just-past full Moon to the left of Saturn. You’ll see them over the south-western horizon in the pre-dawn twilight. 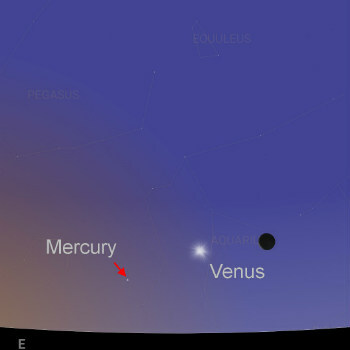 You have one last chance to spot Mercury in the evening sky of the 3rd. 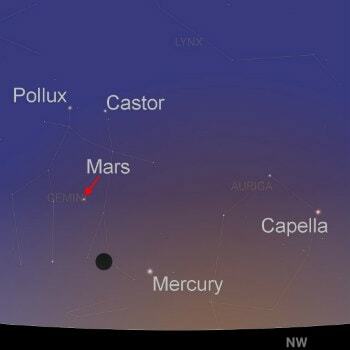 A thin, crescent Moon appears to the lower right of Mars and Mercury in the twilight. You’ll need to start looking soon after sunset, as the trio will be low and will set soon after the Sun. 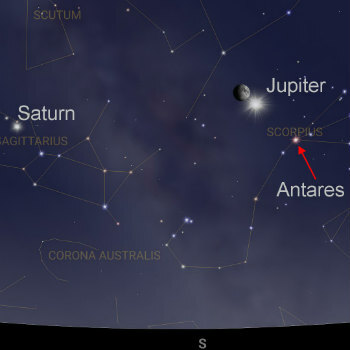 The Moon catches up to Jupiter on the 13th and can be seen to the planet’s left quite late in the evening. Two days later and it’s just to the right of Saturn. Mercury has now left the evening sky and returned to the pre-dawn twilight. You can glimpse it fairly low toward the east from around the 9th of the month. 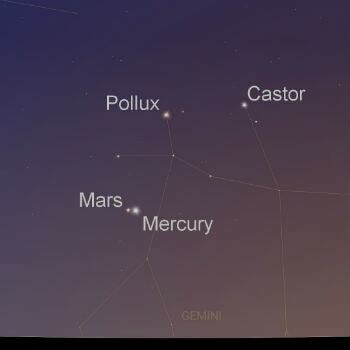 Unfortunately, there are no bright planets nearby but Castor and Pollux, the twin stars of Gemini, can help to point the way. Meanwhile, also on the 9th but in the evening sky, you can catch the first quarter Moon just to the upper left of bright Jupiter. 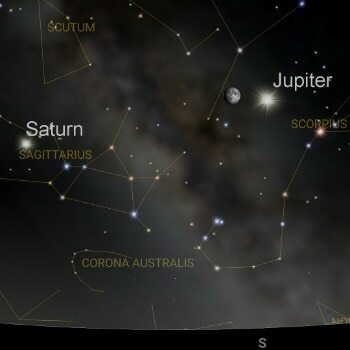 Two days later and the Moon will appear to the right of Saturn. Look again on the 12th to see how the Moon has jumped over the planet and is now on the other side. Mercury, Venus, and Mars are all lost within the Sun’s glare this month, leaving only Jupiter and Saturn visible to the naked eye. The first quarter Moon appears to the right of Jupiter in the evening of the 5th. The Moon catches up to Saturn on the 7th. The pair can be seen in the evening sky with the Moon just to the right of the ringed world. As with last month, come back the next night to see how the Moon has now passed the planet. 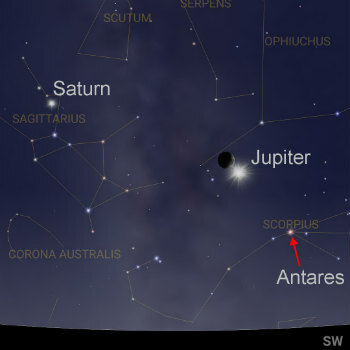 The pattern repeats in early October, with the crescent Moon to the upper left of Jupiter in the evening sky of the 3rd. You’ll find it hanging to the lower left of Saturn after sunset on the 5th. Three weeks later and Mars has started to emerge into the morning sky. By this time the Moon has turned full and then thinned to a crescent. 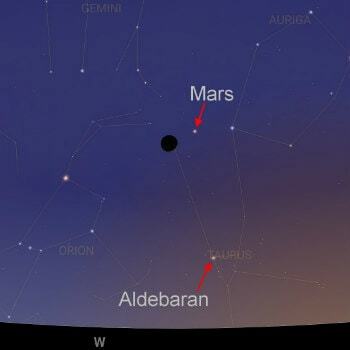 It can be seen to the upper left of the red planet in the pre-dawn twilight of the 26th. By the end of the month, Venus has also escaped the Sun’s light. 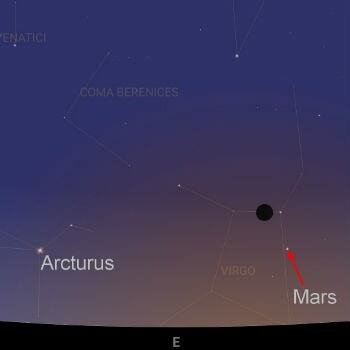 Unlike Mars, it can be seen in the evening twilight after sunset. The new crescent Moon appears to the upper left on the 29th. By Halloween, the Moon has passed Jupiter. 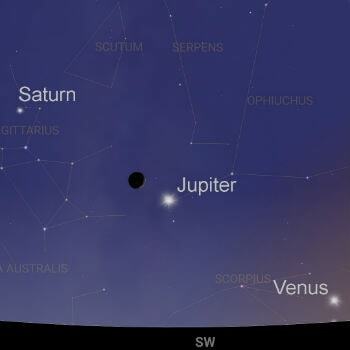 It will then present a suitably spooky sight for trick or treaters with Venus and Saturn also nearby. 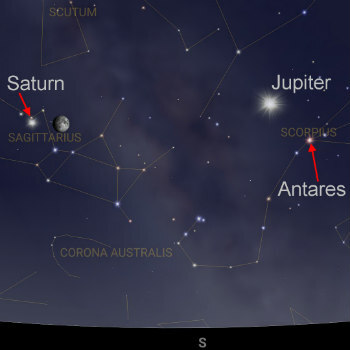 The Moon skips past Saturn in the evening sky during the first two days of the month. After that, things get a little quiet until the end of the month. 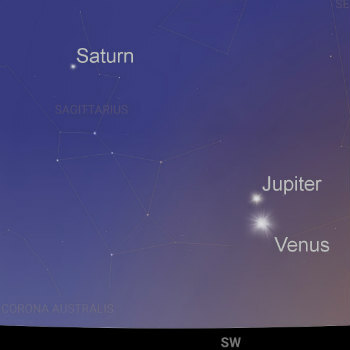 From the 22nd to the 24th you can see Venus pass below Jupiter in the evening twilight. The pair will appear level with one another on the 26th. Meanwhile, in the pre-dawn morning twilight, the thinning crescent Moon passes Mars on the 24th. 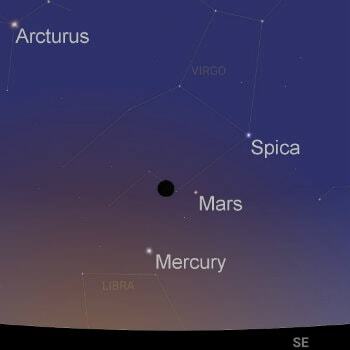 If you can see the bright star Spica, you can draw a line through the star and Mars to point you in the direction of Mercury. If the tiny planet eludes you, try again the following morning, when the nearly new Moon appears to its lower left. The Moon returns to the evening sky for the last few days of the month. 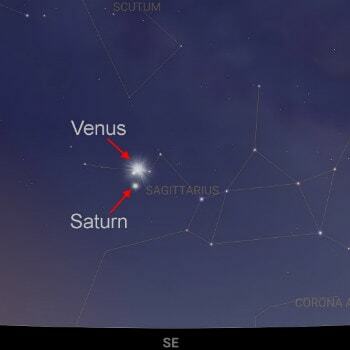 Look for it just to the upper right of Venus on the 28th and to the lower left of Saturn on the 29th. 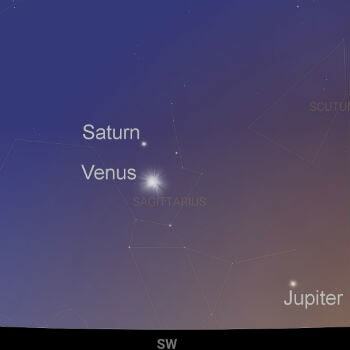 The last month of the year brings a celestial dance between Venus and Saturn in the evening twilight. From the 8th to the 12th, you’ll see Venus pass below and then eventually move into a position to the left of Saturn. 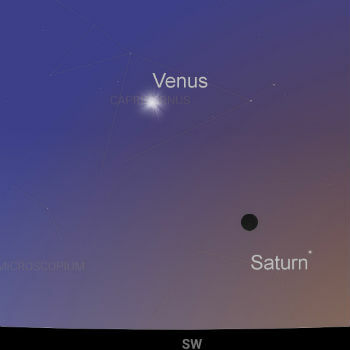 Venus appears directly below Saturn on the 9th. Later in the month, the crescent Moon approaches and then passes Mars. You’ll see the pair close together in the morning twilight of the 22nd and 23rd. The Moon then turns new and returns to the evening sky for the four or five days of the year. 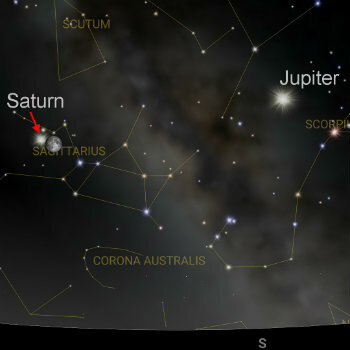 On the 27th, you’ll see a little way to the upper left of Saturn. The next night, the 28th, you’ll see it just below brilliant Venus. 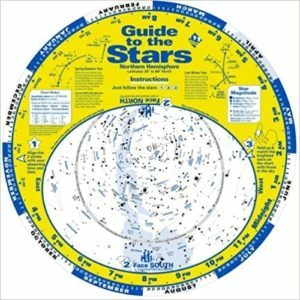 Richard's first website, StarLore was featured in the February 2001 edition of Sky & Telescope magazine which led to him writing a column for Astronomy magazine. Since 2015, he’s written numerous astronomical books.